Just how far would you go to help out your community? 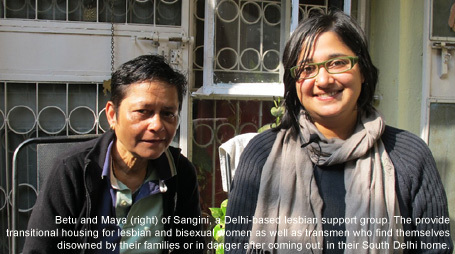 Betu and Maya of Sangini, a Delhi-based lesbian support group, host an average of 20 "guests" – lesbian and bisexual women as well as transmen who find themselves disowned by their families or in danger after coming out – a year, in their South Delhi home and at times risk their own safety to do so. Jennifer Chang and Lisa Dazols are a couple from San Francisco who embarked on a year-long world tour in June in search of gay people who are creating change for the LGBTQ community. 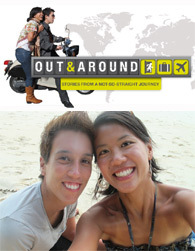 Their project, Out and Around: Stories of a Not-So-Straight Journey, is a collection of their conversations with these “Supergays” around the world. Their trip will cover 15 countries across Asia, Africa, and South America, chosen because those are places where the LGBTQ movement is just starting to take shape, and they want to tell the stories of the people there who are leading the charge. Fridae will republish selected interviews on a regular basis. Readers can follow their journey on www.outandaround.com. Just how far would you go to help out your community? This is what I asked myself when I visited Betu and Maya’s home in South Delhi where they provide transitional housing for lesbian and bisexual women as well as transmen who find themselves disowned by their families or in danger after coming out. Through their organization, Sangini, Betu and Maya (pictured left) host an average of 20 “guests” a year in their home and at times risk their own safety to do so. While they rarely talk to local press so as not to disclose their location, they graciously welcomed us into their home. Lisa Dazols and Jennifer Chang (right) are a couple from San Francisco who are travelling around the world for a year interviewing "supergays" and blogging about them on their website www.outandaround.com. Maya reminds us that seeking safety is only the first step. Maya says, “Everybody wants to be good in front of society. Nobody wants to show society that they’ve run away from home. There are all these self-doubts and most people feel guilty when they come here. Our first intervention when they arrive is trauma counseling.” Yet Maya proudly tells us that with time, their guests are able to gain their own independence. Their guests spend an average of two months in their home and almost all find their own jobs and set appropriate boundaries with their families. So Betu and Maya continue to keep the doors of their guest rooms open an their house fills with visitors, epecially over the holidays. Betu gets to the heart of what motivates them to continue when she says, “It’s really rewarding when we see women who have settled down and who are living with a partner, working, saving money and independent. For them we are their family now.